Cuban-American seniors at the Domino Club in Miami's Little Havana neighborhood. Miami, Florida (CNN) - As we travel across the country for Embed America, we'll be sending in the occasional sound postcard from the road. 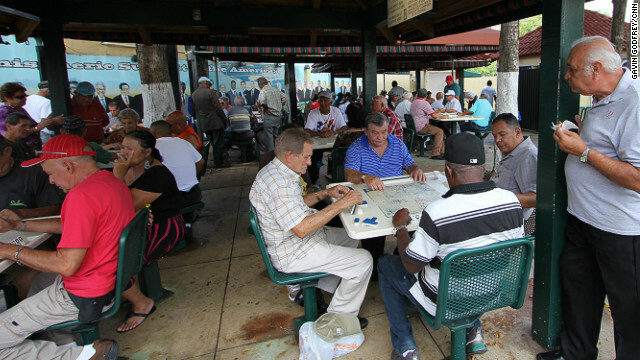 CNN Radio's John Sepulvado sent this postcard from Miami's Little Havana neighborhood, where many older Cuban-American men spend their Saturday afternoon playing games. Just a quick note on the Quebec college increase: because of austerity measures many governments around the world have decided to raise tuition costs. In Ireland and Spain it's a huge deal, with protests and demonstrations following the governments announcements. In the US we've seen protests in California, Puerto Rico, Wisconsin, Georgia...to tie it back into this post, the two younger Cuban Americans we talked to praise the education they get in the US, and their college education as well. They both said it gave them/will give them opportunities family back home didn't have. But they said it was expensive. One young woman told us she still lives with we grandmother to help pay for college, even though she wants to be independent. So I'm just curious: how do you think the state can provide a great education while keeping colleges accessible to financially struggling students?